Zurich's Bellevue Christmas market. Photo courtesy of Switzerland Tourism. 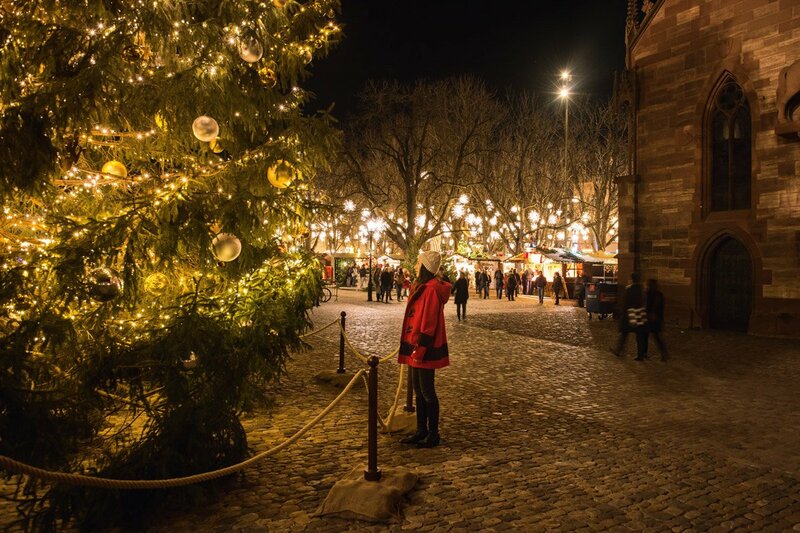 December’s cold days and nights make the perfect backdrop for cheerful seasonal festivities in Switzerland. Linda Cabasin explores holiday traditions and activities indoors and out. SWITZERLAND – On a recent trip to the beautiful cities of Zürich, Luzern (Lucerne), and Basel, I explored places related to the upcoming celebration of the 500th anniversary of the Reformation in Switzerland in 2019. It was also a wonderful time to take in the twinkling holiday lights and creative shop displays, warming food and drink, and special activities including Christmas markets. Yes, there are gray days, snow, and cold weather — but they serve, magically, to enhance the atmosphere. Europe’s famous outdoor Christmas markets originated in the Middle Age in German-speaking parts of the continent, some as early as the 15th century. Today’s elaborate markets evolved from the tradition of seasonal markets in town squares and near churches, where goods were simply displayed for local residents. In Switzerland and elsewhere, markets now spring up in Advent like mini-villages, luring visitors from near and far with cheerfully lit and colorfully decorated huts and stalls selling Christmas and holiday gifts, food, and drinks including the famous glühwein — that fragrant warm mulled wine made with sugar and spices. 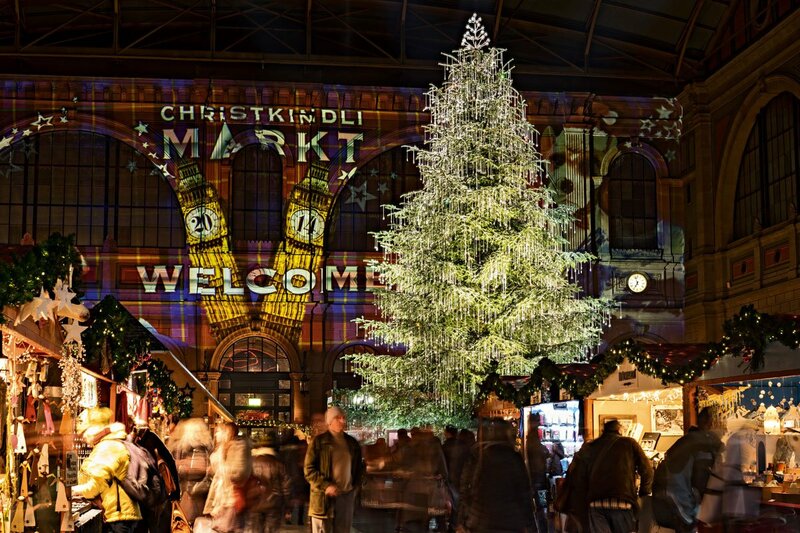 There are plenty of festive activities beyond the markets. Many of Switzerland’s markets are fairly new, but cities and towns are creative, perhaps competitive, in devising new events. (Medieval traders could not have dreamed of Switzerland’s pop-up chalets that serve as super-cozy lunch spots and bars.) Outdoor concerts, ice skating, special illuminations, and short-term theme markets all complement pleasures such as window-shopping on ancient cobblestone streets and enjoying a warming traditional meals. These are the highlights of the places and activities I discovered. An enormous Christmas tree on the Muensterplatz in Basel. Photo courtesy of Switzerland Tourism. Locations add a lot to a market, and Münsterplatz is especially atmospheric. The stalls nestle beneath the red sandstone Romanesque and Gothic Münster (now a Protestant church, and well worth a visit), which overlooks the Rhine. Barfüsserplatz is steps away, and together the markets have 180 stalls open from late morning until 8:30 p.m., making it Basel Switzerland's largest market, with many special events. I saw Christmas ornaments, jewelry, folk crafts, and textiles (practical and decorative), including items from Asia and Russia. Since I’m not a big shopper, I like visiting markets in the crisp evenings, when locals arrive in throngs for drink and food from waffles to grilled sausages to the chewy gingerbread known as Basel läckerli. This is when you can really appreciate the wooden huts’ creative decorations and lights. Reindeer and stars rise from the roofs of Basel’s stalls, and a towering Christmas pyramid makes a good drink stop. But when I explored at lunchtime — pro tip: always go to a market hungry — I ate indoors on shared wooden benches and tables filled with locals enjoying everything from apple strudel to sausages to (my choice) a bowl of hot spaetzle in a creamy sauce with wild mushrooms. The temporary alpine-style café even had lace curtains. Colorful details from the Johann Wanner shop. Photos by Linda Cabasin. 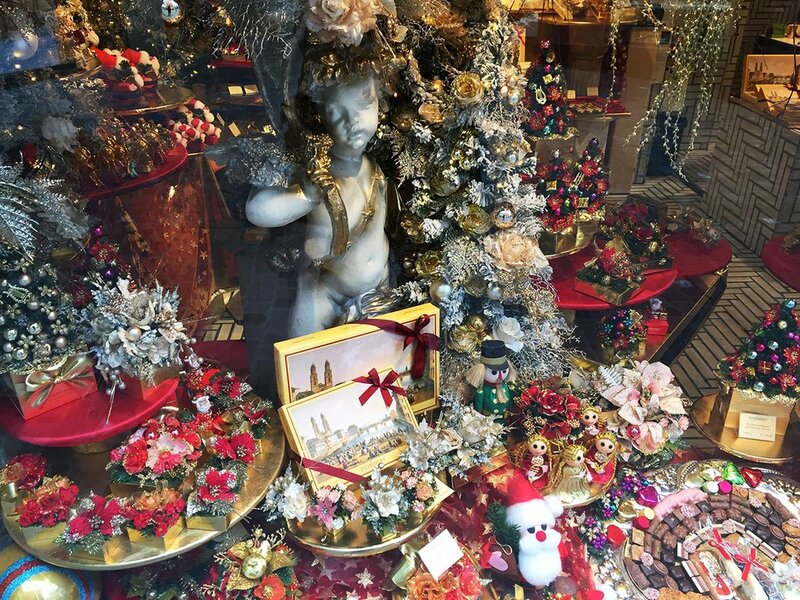 I love the glittering Johann Wanner shop, a local institution full of holiday cheer on a quaint street in the Altstadt (Old Town) near Basel’s Christmas markets. If you seek unusual, beautifully crafted ornaments of any size or color, from traditional to contemporary, head here. 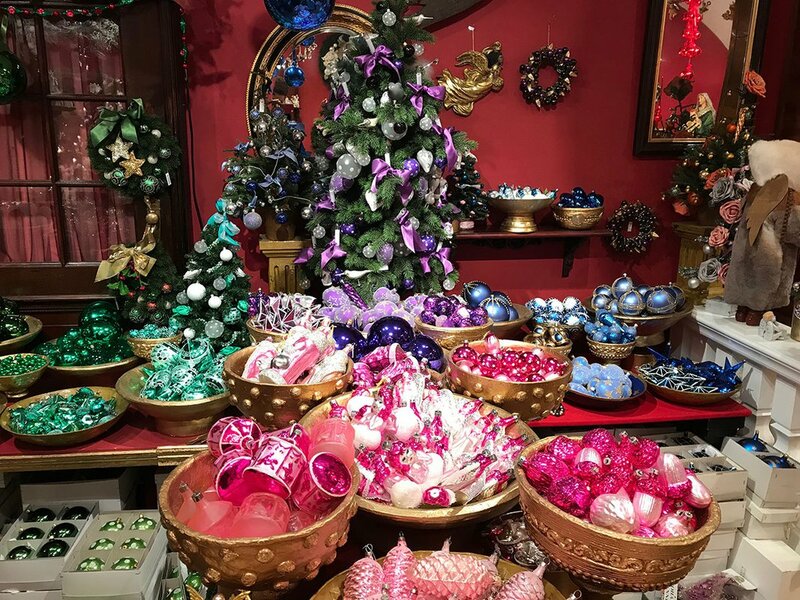 The small, crowded rooms are almost overwhelming, with items from Thuringia (Germany), Poland, the Czech Republic, and other places, in a range of prices and colors from green to blue to pink, with areas of the store arranged by hue. Turn on the lights! Photo by Linda Cabasin. Building mapping gives an edge to the normal market experience. Photo courtesy of the Illuminarium. 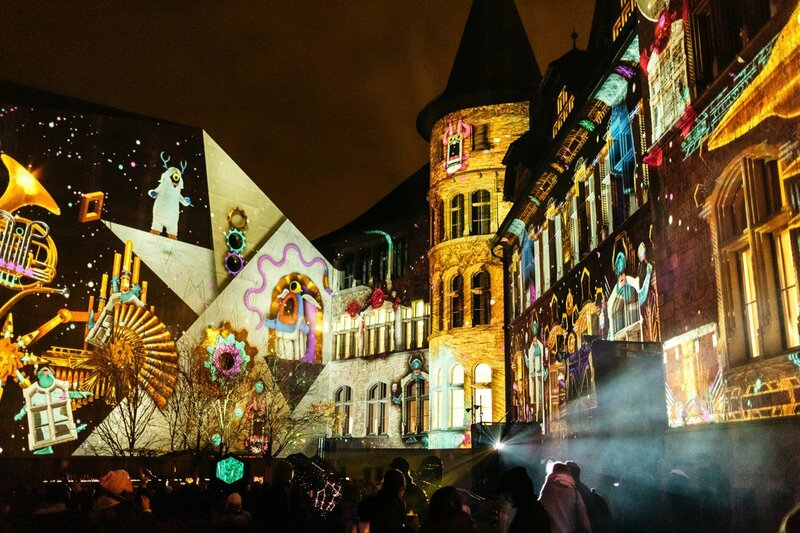 Locals and visitors love Switzerland’s holiday festivities, so there’s often something new. 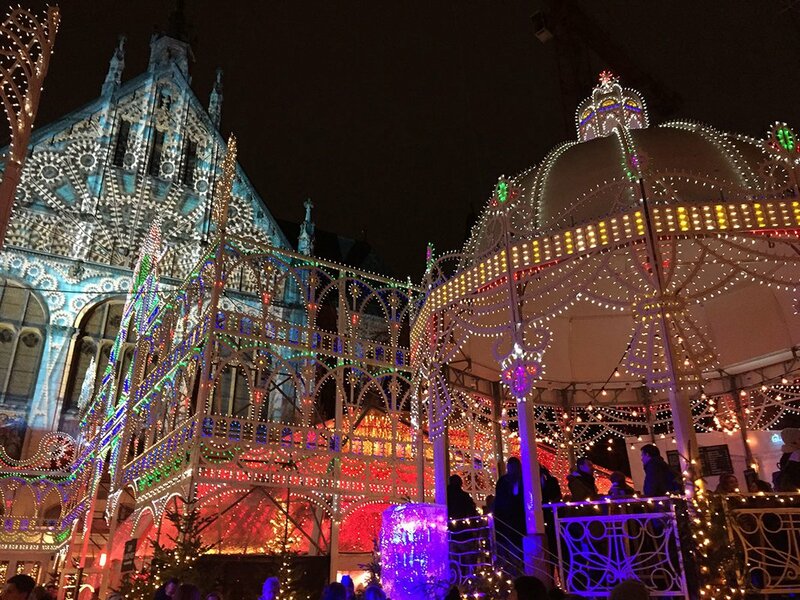 I saw Zürich’s latest contribution, the Illuminarium, on a midweek night, when the light festival was packed with an under-40 set of happy Zürichers. The large courtyard of the Swiss National Museum includes the castlelike neo-Gothic original building and an angular modern addition. For the holiday, the building’s turrets and windows were dramatically lit, and their shapes were echoed in fanciful temporary structures and domes in bold rainbow colors. Nothing subtle, but I liked it on a cold night. Outdoor fire pits with seating provided warmth for those eating and drinking, and people flocked to the indoor bar. Prosecco, cocktails, and hot chocolate (I dipped a chocolate popsicle into the hot milk to create it) laced with liquor were favored drinks. Admission to the courtyard light festival was free, but there’s a charge (13 SF, less for kids) for the 15-minute modern light show. Music accompanied the antics of curious creatures who roamed the colorful walls, looking like something from Pop artist Peter Max. The show also included an interpretation La Traviata. I didn’t expect to enjoy it, but it was witty enough to satisfy kids and adults. Welcome to the market! Photo courtesy of Switzerland Tourism. 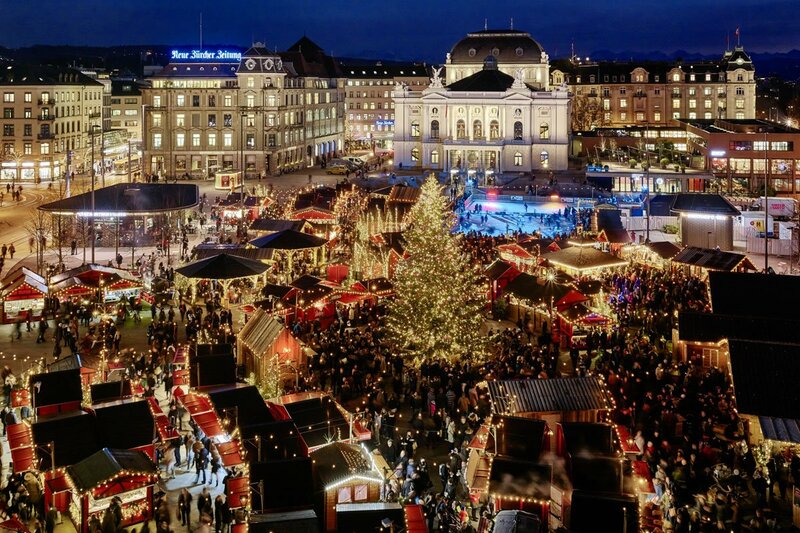 The outdoor Wienachtsdorf, or Christmas Village, is at Bellevue near Zürich’s Opera House and public transportation. The smaller market is only a few years old, but has something for everyone, including non-shoppers like me. I couldn’t resist the après-ski pop-up bar or the witty fondue chalet called Klosters, complete with skis, a library, sofas, alpine decoration, and plenty to drink. There’s a merry-go-ground, ice skating, and outdoor stalls selling pretty jewelry and crafts as well as eclectic eats like Wagyu beef on ciabatta. 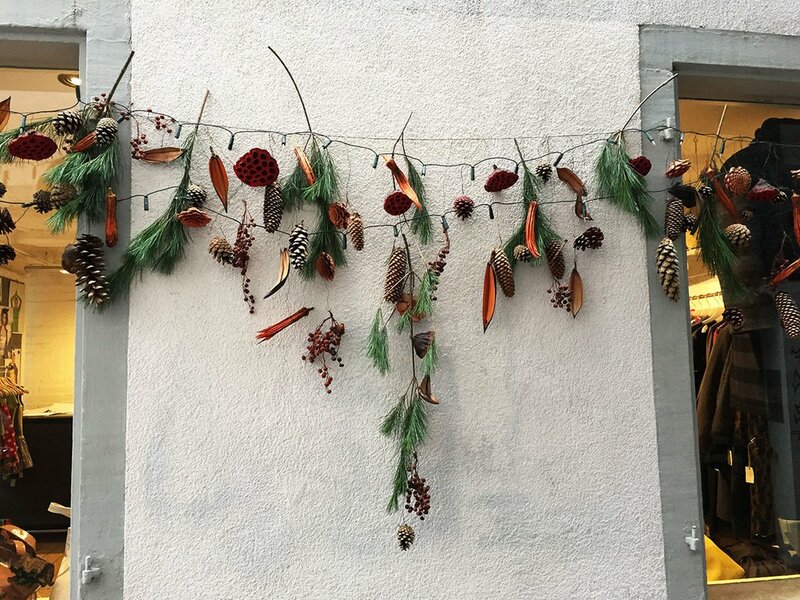 Simple decorations in Zurich. Photo by Linda Cabasin. 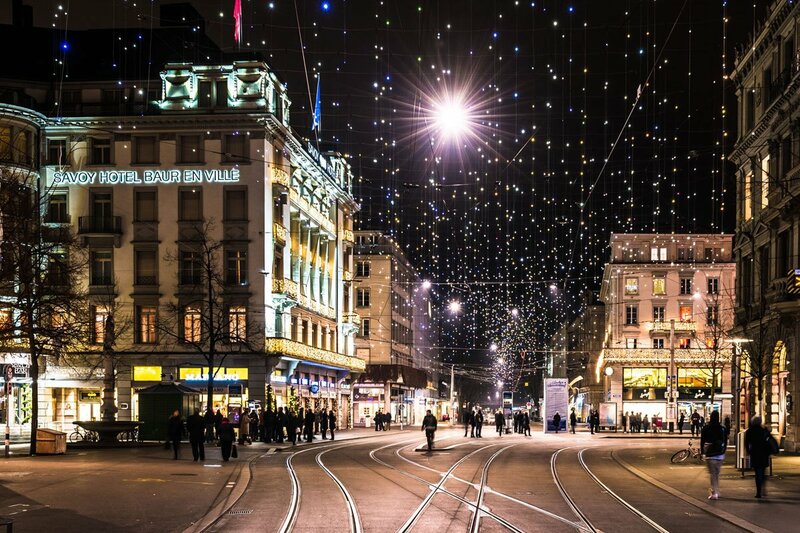 One holiday pleasure is a special, traditional meal, and the cities I visited provided memorable Swiss experiences. One cold, damp night in Basel’s Old Town, nothing could have been better than sitting near the cozy bar of Walliser Kanne, talking and eating warm cheese fondue. White walls and dark wooden beams set the mood; the smells of cheese and wiener schnitzel were tempting. There’s something so companionable about fondue: sharing a basket of cut-up bread, stabbing it with the long forks, and dipping it in the cheese-and-wine mixture. Don’t let your bread drop into the wine, or custom says you’ll have to pay for the next round of drinks. Zürich’s once-powerful trade guilds built houses near the riverfront as gathering places, and today some buildings have atmospheric restaurants. Still owned by a guild, Zunfthaus zur Waag, on Münsterhof near the Fraumünster church, is a 17th-century building, the most recent incarnation of several on the site since the 14th century. This is a place for a splurge on seasonal specialties; I had richly sauced venison with spaetzle and red cabbage. Other options were sliced veal Zürich-style, with a creamy mushroom sauce and rösti, Switzerland’s fritter-style potatoes; or fried perch fillets with almond butter and boiled potatoes. Another treat was wine, including pinot noir, made in the city. Luzern is on the River Reuss and beautiful Lake Luzern, ringed by mountains. Boat rides are irresistible here, year-round, including on the 20 boats (five of them classic steamers) of the Lake Lucerne Navigation Company. My first experience with the Swiss melted-cheese specialty raclette was on the MS Diamant, a sleek new boat that fits 400. Raclette is a wheel of semi-hard cow’s milk cheese that's heated and scraped onto small boiled potatoes. There are different ways of making raclette; diners on board each had their own tray (over heat) to melt different flavors of raclette. White wine and side dishes like picked onions, mushrooms, and gherkins rounded out the meal. There was plenty of time to look at the holiday lights — and the colorfully illuninated, seasonal ice-skating rink by the lakeshore — as we left and approached the city. It was delicious, though I’m lazy enough to prefer having a pot of fondue bought to me. Breakfast and lunch cruises were other available options. Lucy in the sky with diamonds. Photo courtesy of Switzerland Tourism. If one urban holiday experience stole my heart, it was browsing and walking the winding, cobblestone streets of the right bank of Zürich’s medieval Altstadt. The River Limmat flows out of Lake Zürich, dividing the old town in two. The left bank includes the famous Bahnhofstrasse, lined with expensive stores and stroll-worthy anytime, especially when the colorful LED light holiday display known as Lucy (from the Beatles song “Lucy in the Sky with Diamonds”) came on and seemed to fill the sky like stars. Still, I preferred the pedestrian districts around the Niederdorf and Oberdorf areas on the right bank. Kirchgasse, a street leading north from the Grossmünster (great modern stained-glass windows by Sigmar Polke) where Protestant reformer Ulrich Zwingli preached, charmed me with shop windows filled with art, antiques, old books, and prints. Other stores tempted with whimsical gift and design items and colorful clothes. Christmas stalls popped up on several streets, but it was the generally low-key seasonal decorations, some with dried fruit and branches, on the historic buildings, that were irresistible. 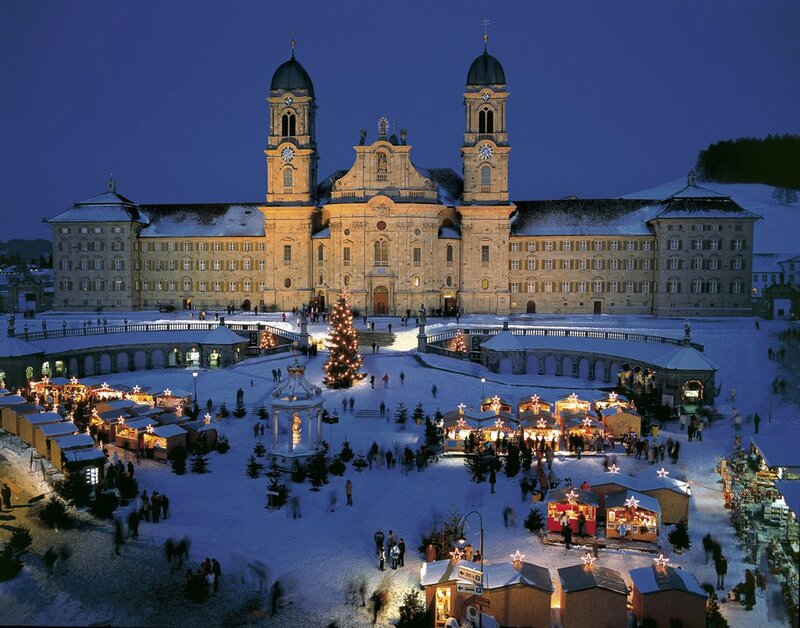 Lovely Einsiedeln. Photo courtesy of Switzerland Tourism. It was hard to leave Luzern, with its ancient center and pretty Christmas market, but I’m glad I took the scenic Voralpen Express train (the easy trip was just over an hour, thanks to Switzerland’s amazing train system) to see Einsiedeln’s lavish 18th-century Baroque abbey church, a Catholic pilgrimage site that is part of Switzerland’s largest monastery. Another treat: the 130-plus Christmas stalls that filled the snowy church plaza and spilled down the town’s browsable Hauptstrasse (main street). I loved the spectacular setting for this nine-day market, which has stalls of food specialties to eat or buy (honey, mustard, cheese, and Swiss Christmas cookies) and local crafts. I didn’t buy Christmas cookies from Tulipan on Klosterplatz, but I did see the gingerbread museum at a classic bakery. The latter preserved old-time charm and sold treats including special pilgrims’ cookies and spicy lebkuchen — perfect for the ride back.